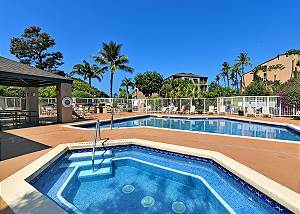 Tucked behind a mimosa tree in the heart of South Kihei, lies an unbeatable Hawaii vacation getaway experience at Pacific Shores. This central location allows you to step easily into the island lifestyle as shopping, good eats, and world famous shores are just a quick stroll away from your Maui lodging. Resting on 4.75 manicured acres, this condominium community offers guests a sneak peek into South Maui living along with incredible memories. The tropical grounds invite you to discover relaxing recreation amongst the hotel resort property. So, simply let your stress melt away as you soak in the Jacuzzi spa or escape the warm Hawaiian sun with a refreshing dip in the guest-only swimming pool. While each vacation rental villa for rent is outfitted with a fully-equipped kitchen, enjoy the island air and grill up a meal outside in the barbecue area! With palms gently swaying around the picnic tables, this is the perfect setting for a delicious dinner in paradise. Take advantage of the snorkeling as well as the surfing nearby and wander across the street from your Pacific Shores lodging to the white sands of Charley Young Beach. Here you can get your feet nice and sandy as you spend the day playing along the shoreline. Or you can get active and practice your stroke at the close by Wailea Tennis Club facilities as well as Wailea Golf Courses. If you rather spend your time shopping for the perfect gift from Maui, then make your way to one of the many shops that call the south side home. Leave all your worries behind while on a Hawaii vacation at Pacific Shores. With each South Maui vacation rental, guests enjoy free assigned parking that allows them to come and go freely. 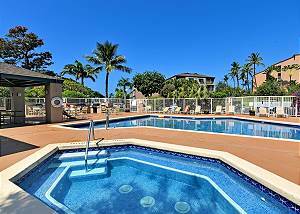 Book your tropical retreat online today and experience one of South Maui’s best kept secrets, Pacific Shores!